Art Now 2007 is co-sponsored by the Ansan municipal government in the form of an international art program and is held as part of the Danwon Art Festival hosted by the local government. The program consists of an artist-in-residence program, a workshop and exhibition, and works produced during the residency are exhibited at the GMoMA. Six invited Korean and foreign artists have incarnated the spirit of late Joseon painter KIM Hongdo, better known as Danwon, his penname anchored in their historical, aesthetic understanding of Danwon. This art event is intended to raise new issues in the Korean art scene and gain a foothold for upcoming international cultural exchanges through its specialized subject, the modernization of Danwon spirit. Imagine Recharge is an art exhibition designed to enable the general public to enjoy works of somewhat difficult to understand contemporary art with ease by kindly offering them explanations. Made up of six sub-themes, Art’s a Mirror, Art’s a Heart, Art’s a Tale, Art’s a Question Mark, Art’s a Dream, and Art’s a Play, the exhibition provides firsthand experiences of contemporary art in a variety of ways from a conventional art show at a white cube to a participatory project completed through interactions with viewers. It also serves as a guide for how the element of imagination, its main theme, is involved in each work and in each meaning it raises. Both children and adults who want to become intimate with contemporary art are expected to discover artistic imagination in six imaginary narratives. 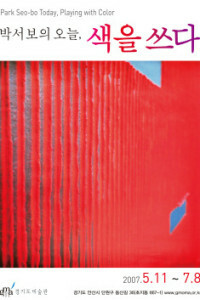 PARK Seo-Bo has been a key artist in contemporary Korean painting. He has been recognized as a pathfinder in contemporary Korean art, constantly engaging in monochromes he refers to as “ecriture.” After 55 years of artistic experience, the exhibition he will join at the GMoMA this year will help set up criterion to interpret his art in a new way. This show is designed to cast light on his recent works, focusing primarily on his latest pursuit of art. The year 2000 was a turning point for Park as it was then that his art made a shift from achromatic monochromes to chromatic monochromes. This shift can be interpreted as something upgraded and expanded that brought a new aesthetic attempt to discover color to his preexisting frame of “ecriture.” Stemming from nature, his colors can be described as spiritual tonalities filtered in a process of sublimation through meditation. Park displays the culmination of an artistic purification by lending unrefined colors commonly found in our surroundings to his canvas. What is most important in his color “ecriture” is a balance between time and light. The upcoming exhibition at Lobby Gallery was designed to make the museum’s lobby space stand out and enable visitors to better perceive its entire space. The exhibition of Jinnie Seo, a post-monochrome artist who shares the aesthetic trend with Park Seo-Bo, will take place here in the lobby. Seo abandoned the widely accepted idea that paintings should be hung on a wall when she began to engage in painting. She manages to extensively evolve three-dimensional drawing through her concerns about space which she has been dealing with in her past two-dimensional works, presenting a new possibility in painting. 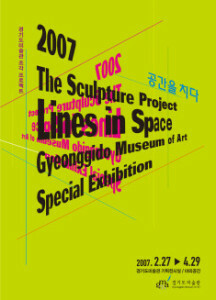 The exhibition Lines in Space aims to explore the new media of expression and expand the domain of representation and the new potential of art through an array of contemporary Korean sculptures and installations whose linear properties particularly stand out. The art show features artworks by 39 sculptors and installation artists who have represented their unrestricted ideas and carried out diverse experiments with form using metal, steel wire, and other flexible materials such as tape, fabric, lasers, and even sound. This exhibition to display unconstrained works free from gravity, volume, and mass will be a special site where viewers are able to experience a new space, time, dimension, material property, mass, and structure. This sculpture project to take place at GMoMA’s galleries and its beautiful open-air park will be followed by the Hwarang Camp Sculpture Park Project. The GMoMA displays intimate works chosen from 218 pieces which were collected in a period from 2005 to 2006 under strict guidelines at the first floor open space. These works are always open to view for free, save for every Monday. Upon entering the museum, viewers may see these works in the central hall, lobby, and hallways and they are able to understand with ease and delight by virtue of brief work descriptions.